Down imaging or down vision sonar technology is actually a step further from traditional sonar technology. It offers a superior quality view of the sonar return, and whatever passes underneath the boat will appear on the screen in a much clear detail than in traditional sonar imaging. This makes it much easier to distinguish between structure and fish and allows you to assess better, how far up in the water column a fish is situated. 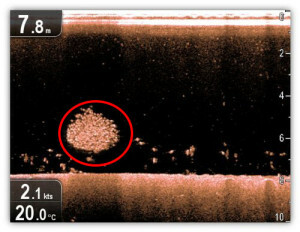 There are several brands that offer fish finders featuring this type of sonar. So far, Lowrance, Humminbird, and Garmin are top of the list. But each one of these manufacturers offers a different palette of features surrounding the Down Imaging sonar technology. Also, even though this type of sonar pretty much works the same regardless of fish finder brand and unit, there are differences and specifics for each one. The first aspect you must know about this sonar technology is that its terminology differs from a manufacturer to another. Garmin calls it ClearVü, Lowrance calls it DownScan or StructureScan, and Humminbird calls it Down Imaging. Regardless how it’s called, it’s basically the same thing. In this post, we’ll refer to it as DI, down imaging or down scan. First of all, a fish finder with Down Imaging or Down Scan requires having this technology built-in the head unit. Or the unit should be at least compatible with a sonar module that has this feature. Normally, the units labeled as “DI”, “CV” or “DS”, have this sonar feature built-in. Also, in order to benefit from the down view, it requires a specific type of transducer, that typically operates at 455 kHz, or has dual-frequency, of 455 / 800 kHz. The down view sonar technology works basically the same as the traditional sonar, only the images are much sharper and clearer, pointing out more fish. On top of that, this technology allows you to distinguish much better between fish and structure. For example, if the sonar passes over a sunken tree, you will be able to determine if there are fish between its branches or not. In traditional sonar view, there’s a good chance you’ll only see the tree. The down imaging sonar view normally scrolls on the screen from right to left. Your boat is placed on the upper right corner. In most cases, the water surface will appear as a white, irregular line, irregularity given by the turbulence of the motor of your boat. The transducer emits sonic pulses into the water which return back to it, providing a specific amount of data about the underwater environment. Each sonar return will materialize on the screen as a thin, vertical plane. As the transducer is dragged through the water, these narrow planes will stack, providing you with a final image of the water column, bottom, fish and structure behind the boat. To put it differently, you can imagine a big water tank behind and below your boat, and yourself on its right side, looking into it. The thing is, the image will appear in 2D, and will be a bit difficult to assess where exactly the fish caught by the beam are, in relation to the boat. You won’t be able to tell whether they’re to the right or to the left. But you’ll know they’re somewhere inside the water column below and behind the boat. together, and you won’t see them. If the sonar signal passes over fish, they will appear on the screen as bright white dots. Bait balls will appear as cloud shapes. Weeds show up as lines, reaching up from the bottom, and you will actually assess how far up from the bottom they extend. This basically goes for every other piece of structure the sonar catches. Evidently, you will also see how up in the water column the fish are located. This way, you will know exactly at which depth to maintain your lure, or how up from the bottom your baits must be placed. When choosing a fish finder with DownScan, many anglers overlook the fact that this technology is quite limited. It won’t work in waters deeper than 300 ft. (91 m) tops. The transducer must be mounted correctly and the boat run at the required speed, in order for it to function at normal parameters. Also, in case you will buy a unit with a smaller screen, which has a split screen function, you should be aware that when observed in split screen, the down view will appear much smaller, and so will be the returns. That shouldn’t be a problem though, because you can always view your sonar in full screen, in single view mode. Okay, I think I’ve covered most of the key-points regarding Down Imaging sonar technology. By now you should have a pretty good idea what it’s about and what it can do for you. So, here are a few aspects that you should know about the fish finders with this type of sonar. 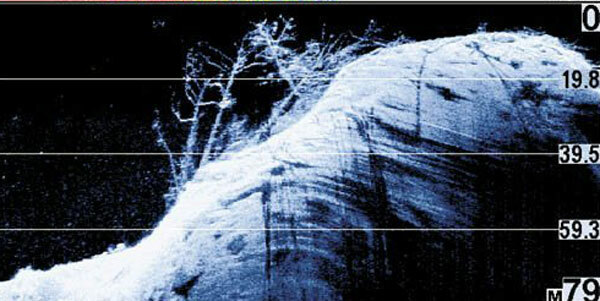 As I mentioned above, Down Imaging is a sonar technology designed for depths up to 300 ft. (91 m). It will be completely useless to you in a deep sea fishing session. For this type of fishing it’s best to use a CHIRP sonar, or at least a fish finder with a transducer that operates at 50 kHz frequency. Since the sonar beam emitted by the transducer covers only the water column below your boat, you won’t benefit from an extreme coverage. I mean, depending on unit and transducer, the beam can extend for up to 60°. That’s still a good coverage, but it can’t be compared with the huge portion of water covered by Side Imaging. So, keep in mind that if you will get a unit that only has DownScan and not SideScan, you will have to sail over a wider area multiple times, in order to see every good fishing spot. Depending on the boat you have, you may require a different type of transducer. For example, a fiberglass boat may require a through-hull transducer, while an aluminum boar with a flat transom, would require a transom-type transducer. In case you will be using a kayak or a rental boat, a smaller, or even a portable unit may be more indicated. This is a very important aspect to know about a certain fish finder before you purchase it. Even though various models are advertised as DI fish finders, that may only stand for the head unit of the model. In other words, the unit is capable of DI. But the box may not include the Down Scan specific transducer, which you will have to pay extra for. Therefore, make sure you purchase a unit that has the Down Imaging sonar built-in the unit, and the box also includes the DI transducer. Needless to say, the more features or options a device such as this has, the higher the price. Most units that come with DownScan and SideScan, also include quite a wide array of navigational features. You may not need, nor want any of those. Therefore, in this case, it might be a good idea to opt for a unit that focuses exclusively on fish finding capabilities, without being a chartplotter as well. Maybe the best indicator for the price range of a fish finder is the diagonal of the screen. In general, a unit with a screen over 7″ in diagonal, isn’t exactly cheap. In general, the bigger the head unit, the higher the number of features and options the unit has. However, not all widescreen units may include all the features they’re advertised for. They may support a wide range of technologies, but most of them have to be purchased separately. 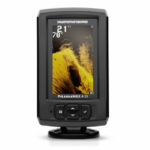 Example: the Humminbird ION 12. Touchscreen technology also reflects a higher price. There’s a good chance you will find a fish finder with the same sonar and chartplotting capabilities, but with regular navigation (through buttons), for a better price. Most (if not all) fish finders that come with Side Imaging, also include Down Imaging. But there are units that support only Down Imaging, such as the HELIX 5 DI GPS from Humminbird, for example. These units are normally cheaper than the similar ones with SI as well. Of course, the more features, the higher the price. When it comes to pricing, there are Down Imaging fish finders beginning at $150. And for a price under $1,000 you can get quite an exceptional fishfinder and chartplotter. In the following part of this post, I’m going to point out for you, some of the best DI fish finders by price range. And when it comes to Down Imaging sonar, without Side Imaging, it appears that Humminbird is holding most of the cards in terms of fish finders. 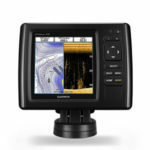 The Humminbird PiranhaMax 4 DI is a newer version of the PiranhaMax 197c DI. It’s a sonar-only fishfinder, doesn’t have any navigation features, but does offer both 2D and Down Imaging sonar. It comes with the XNT 9 DI T transducer which has a transom mount and also integrates a temperature sensor. The system can use two frequencies – 200/455 kHz for the traditional sonar, while for Down Imaging it uses the 455 kHz frequency. It can scan depths up to 600 ft in 2D and up to 300 ft in Down Imaging… Read Full Review. The echoMAP CHIRP 53cv is one of the most popular Garmin 5-inch units. It offers a pretty consistent array of fish finding features, including 2D High CHIRP, and ClearVü sonar. It includes the new CV22HW-TM ClearVü transducer, which is temperature capable and features a 4-pin connector. With this transducer, the system can use a High CHIRP modulation of 150-240 kHz for 2D, while the CV CHIRP frequency intervals are 425-485 kHz and 790-850 kHz. This unit is also a chart plotter. It includes the US LakeVü inland fishing charts. If you’re looking for the offshore model with the BlueChart g2, that is the 54cv. It has a fast and accurate internal GPS, and also has the QuickDraw Contours feature… Read Full Review. 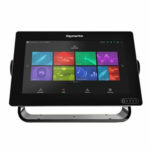 The Simrad GO7 XSE is a multifunctional display pretty similar to a tablet. It actually offers more sonar capabilities than the 2D CHIRP sonar and DownScan imaging provided by the HDI Skimmer transducer that it comes with. It’s also SideScan and ForwardScan capable, but it requires a different transducer to use those sonar technologies. With the included HDI Skimmer transducer, it can use two 2D frequencies – 83/200 kHz – which means that it can use Medium and High-Frequency CHIRP sonar, while for DownScan, it uses 455/800 kHz. Its depth capabilities can reach 1,000 ft. 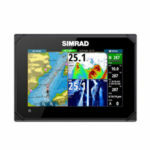 This Simrad fish finder is also an advanced navigation unit. Not only that it is equipped with a 10 Hz GPS system, which can provide accurate position updates 10 times per second, it also includes the US Insight charts which offer advanced details for over 8,000 US lakes and rivers, with detailed contour lines, relief shading, shoreline details and depth soundings to 1,000’… Read Full Review. The Axiom units from Raymarine are multifunction displays, offering a wide array of sonar and navigation features. This unit is actually capable of RealVision 3D Sonar if paired with an RV-100 transducer. However, this is the DV unit, the one that comes with the CPT-100DVS DownVision transducer. With this transducer, the unit can use 2D CHIRP sonar and DownVision sonar applications. In terms of navigation features, the Axiom 9 integrates a 10 Hz 72-channel internal GPS/GLONASS receiver. This being said, it can provide 10 position updates per second, while the movement of your boat will appear on the display in real-time, without jumps from a point to another. It is also equipped with the Navionics Nav+ US & Canada charts (or the NAG charts) which cover more than 20,000 in-land lakes and the U.S. / Canada coastal waters, offering superior detail for navigation and fishing… Read Full Review.